The Medical Library Association (MLA) held its 2018 annual meeting in Atlanta, Georgia from May 18th-23rd. 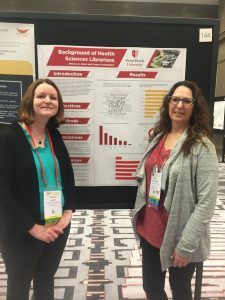 Health Sciences Librarians Jessica Koos and Laurel Scheinfeld presented a poster on their research project investigating the educational and professional backgrounds of medical librarians. Jessica Koos also presented on a grant project co-authored by librarians Jamie Saragossi and Gregg Stevens, in which they trained public librarians on how to use free online health resources created by the National Library of Medicine. MLA’s next annual meeting will be held from May 3rd-8th in Chicago, Illinois.